In high school, I thought my senior year was rough ... 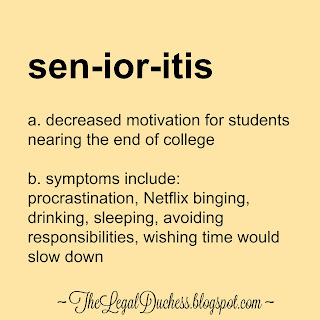 I thought that was the time of "senioritis." I was wrong. College takes it to a whole other level, my senioritis affliction is currently pretty darn serious but in a different way. In high school, I just wanted to be done and go off to college and live on my own. I was facing exciting changes, and I was dying to feel like an adult. Now, I have been an adult for four years, lived on my own, paid my own bills and realized being an adult isn't quite as glamorous as it seems. Facing some huge life changes and even more "adulting" is making me want to stay in undergrad forever. I think it is the fact that I am facing such major life changes after graduation (marriage, home ownership, moving to a new city, law school) that is making me want this semester to never end. The fall semester of my senior year seemed to drag on forever, and now this spring is flying by. I have so much homework and so many things to do and graduation is creeping up on me so fast, and I am not ready. My wish to stay in undergrad is not making me any more productive ... I have so many papers and so many presentations and final exams to study for ... yet all I want to do is cuddle with my puppy and binge watch "The Office." I have so much work just looming over my head and absolutely no motivation to do it. I may be over the schoolwork of undergrad, but I still am not quite ready to leave. I have also started to realize that college is one of the most fun times of your life. Never again will I get to live with my girlfriends and eat cookie dough while avoiding studying. Never again will I have a part-time job that is fun and easy and not terribly serious. Never again will I think it is OK to skip class and watch Netflix until noon. Never again will I have summers off to travel the world or go home to my parents and have them do my laundry and cook me dinner. Never again will I have free access to a really nice gym. I went to undergrad in the same town I have lived in since I was 10 years old. I have called this adorable little town "home" for a huge portion of my life, and I love it. My undergraduate institution is also both of my parents alma mater. It had always been a huge part of my life even before I was a student. Though I lived on my own through college, my parents were only 10 minutes away, and I could go home for a home cooked meal or to have my mom wash my dress pants. I am comfortable and safe here, and now I am moving away and leaving all that behind ... I am moving to a new city that I do not know much of anything about. I have to start at a new college that I have no attachment or affiliation to. Though it is exciting and a new adventure, it is a little bit scary to leave somewhere I have called home for not only my four years of college but also my pre-teen and teenage years. Senioritis for college is turning out to be rather strange ... I am so ready to be done yet at the same time I am scared to death to leave the comfort of my calm, small town and liberal arts college. My four years here have been a rollercoaster of emotions; they have been hard, stressful, emotionally trying and there have been days I wanted to quit. They have also been fun, mind opening, empowering, full of lasting friendships and memories I will cherish for a lifetime. I would not change my college years for anything and I am cherishing my last few weeks here. 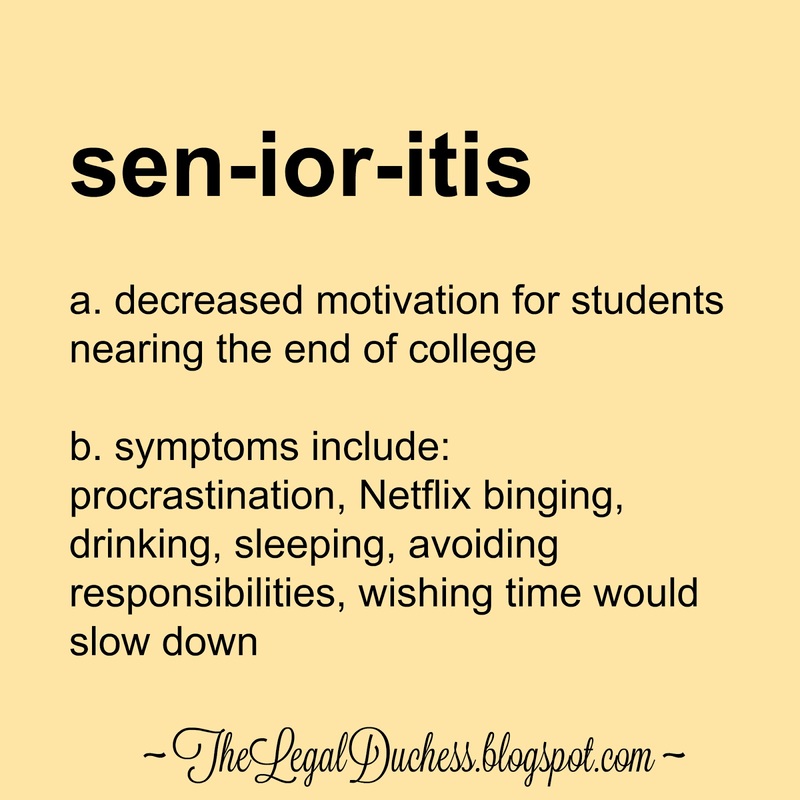 I may have "senioritis" but I am happily afflicted and enjoying every second.